If you believe that you aren’t really on holiday until you are fully immersed in a turquoise and deliciously salty ocean, then you need to visit some of the best beaches in Bahamas surrounded by luxurious Bahamas Villas. This spectacular country, lying a few hundred miles off the US coastline, is made up of 700 islands each with their own pristine beaches. The only difficulty you will discover is trying to narrow down the very best beaches in The Bahamas from which to launch yourself into the wide blue yonder. To help you with this decidedly first world problem, I am setting out below a list of the 10 best beaches in The Bahamas that are simply waiting for your arrival. So, grab that bucket and spade, throw your snorkel and flippers into your beach bag, add a splash of adrenalin and a whole lotta fun for we’re boarding the boat of dreams as we tour around the warm and languid waters that brush against some of the loveliest beaches in the world. Welcome to The Bahamas! In no particular order, I am going to give you my pick of the ten best beaches in The Bahamas. I’ve switched it up a bit as in my experience one man’s (or woman’s) idea of what constitutes the ‘perfect beach’ can vary wildly. For example, some want the Robinson Crusoe experience of being alone with the wonderment of nature while others look for a high-octane beach bustling with activity. There are fifty shades of turquoise in between for everyone else. So, let’s get started …. 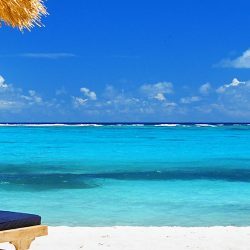 Travellers say “I’m going to Nassau” for my vacation when what they usually mean is they are going to New Providence Island that hosts the capital city of the Bahamas, Nassau. This terrific island has a host of interesting facts ranging from Colonial architecture that remind us that this destination is part of the British Commonwealth, duty free shopping, a lively night life and of course …. beach life. Probably the best beach in Nassau is Cable Beach. This treasure offers pristine powder white sand and the clearest waters (a feature of all The Bahamas islands, to be honest). As Nassau is a stop-off point for a lot of cruise ships, it’s nice to know that this beach is a peaceful haven away from the Port (about 10 minutes by car). There’s ample space for you and your group to find that quiet and peaceful beach experience. With lounge chairs to rent and restaurant facilities, it’s not so off-grid. You won’t be sorry you visited one of the best beaches in Nassau Bahamas. I think the name alone is an enticement to visit this pretty beach. It’s no surprise why this location features in “Nassau Bahamas Best Beaches” list year on year. At a distance of about 30 minutes by car from Downtown Nassau, it is the idyllic get-away choice for beach lovers. The stillness of the waters with a coral reef that comes right up to the shoreline, make this a wonderful destination for families who want to introduce their children to snorkelling. With lounge rental services and some snack foods available nearby, it is a pleasant place to spend part of your vacation. 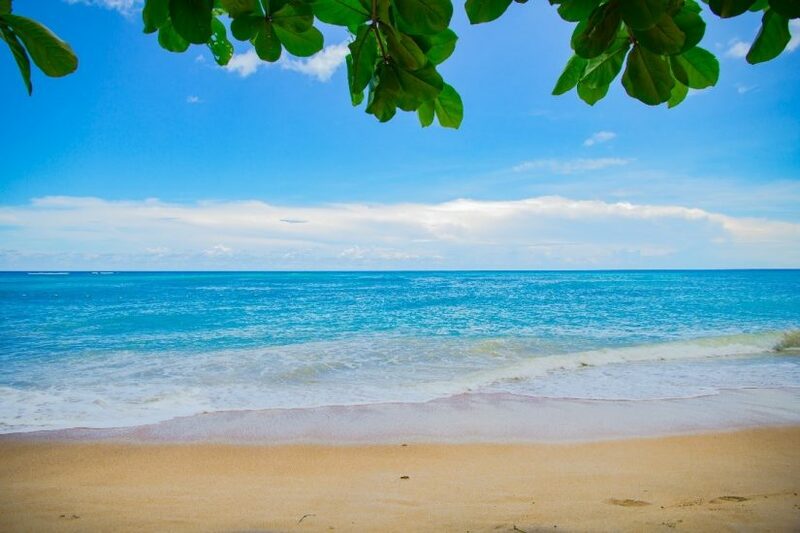 How will you feel about the beach after a day here? I think there’s a clue in the title! This lovely beach is a short walk from the Cruise Port, so you will find it can get a little busy. I suggest you go early and perhaps utilise the extra comfort to be found at the Junkanoo Beach Club. Rent your lounge chairs, settle down under your umbrella, enjoy a delicious lunch and a cocktail or three. 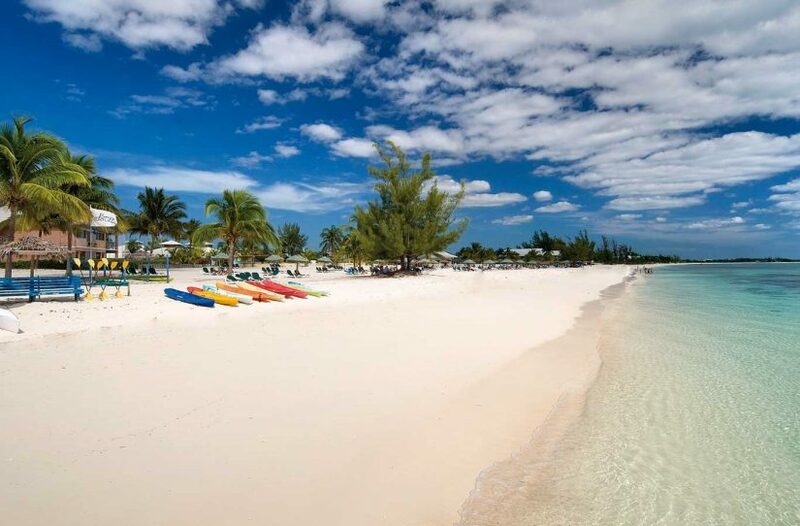 Taino Beach is considered one of the best beaches in Grand Bahama if you enjoy people watching. As well, it is ideal if you are that couple where one loves to soak up the sun with a good book and the other wants to be out on the water being an action body! 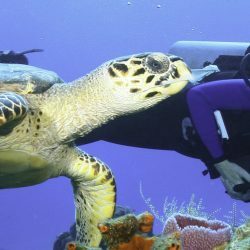 Kayaking, paddle boarding, snorkelling – it’s all on offer here so well worth a visit if you are on the island either as a day tripper or a guest at one of the fabulous Exceptional Villas to be found on Grand Bahamas. 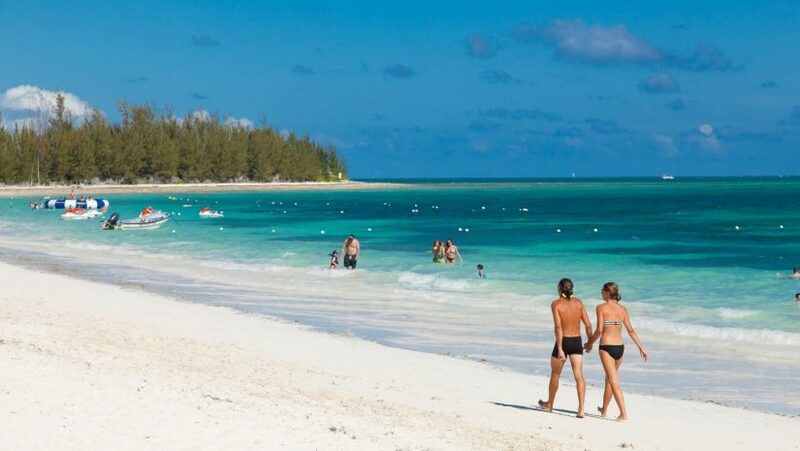 My second pick under the heading of Best Beach on Grand Bahama Island has to be Fortune Beach. This is the picture-postcard beach that Caribbean tourists always want eg. 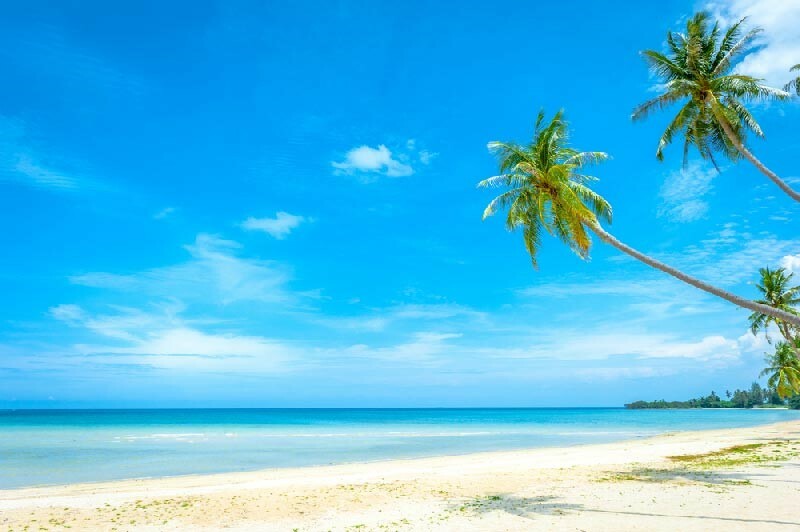 Palm trees dotted across milky white sands, hugging the turquoise shallow shoreline. There are some lovely vacation spots near the beach, restaurants offering delicious seafood plucked fresh from the sea, so a day of exploring the beach followed by a tasty lunch at, say, the Banana Bay restaurant is a good plan. Grand Bahamas the nearest of The Bahama Islands to mainland USA has a whole host of attractions to lure delighted visitors. It’s a destination not just for best beaches, in Grand Bahamas you can enjoy incredible weather, duty free shopping and lots of lovely outdoor activities – only a few of the best things to do in the Bahamas. A flight time of under 1 hour from mainland USA will have you relaxing on a lounger a world away from your life back home! I’ve written about some interesting beaches in my time. I believe that Pig Beach sounds just about the most uninspiring name one could imagine for what should be a gorgeous and sublime experience. Fret not! 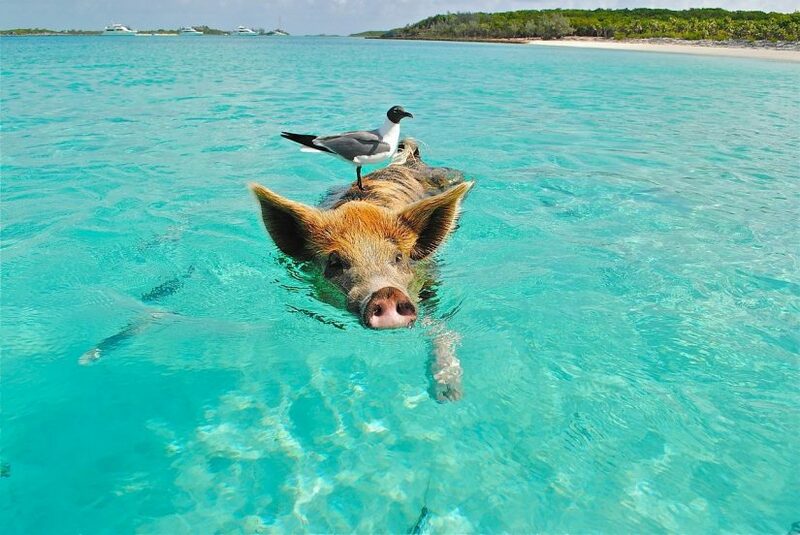 This beach is so called to honour the tribe of interesting piggy’s who live on Grand Exuma and take to the waters each day. It’s no surprise that this beach is one of the bahamas best beach for the unique experience these swimming pigs! With the world getting a bit concerned about the negative impact of humans interacting with dolphins in their natural habitats, you can indulge your zoological tendencies to the fullest without concern. The pigs love the human visitors. The humans most certainly love the pigs. It’s a win-win situation. Put it on your bucket list of incredible best beaches in Bahamas to experiences! If you’re in the Bahamas fishing and catch one of these porcine pretties it would be best to put it back into the sea. From Pigs we’ve moved on to a Cat Island – one of the Bahamas Points of interest! No, there aren’t hordes of cats splashing around in the shallows – maybe one or two lazy ones sunbathing outside a traditional Bahamian home – that’s about it! This island has the natural wonder of having the highest ‘mountain’ in The Bahamas. At a dizzy height of a mere 206 feet, you can walk up to visit The Hermitage on Mt Alvernia, a ruin of a church built in the 1930s by Father Jerome, a man in search of sublime solitude. Once you’ve tackled the climb you will need to go straight to Pink Sand Beach an 8-mile marvel of natural beauty where you can swim and enjoy your version of sublime solitude! Cat Island has managed to retain all the qualities of true Bahamian life without too much of the unwelcome aspects of modern life. It’s a great destination for a day of exploration. Sidney Poitier, the award-winning actor was born on this island. It’s really hard to believe he ever wanted to leave! 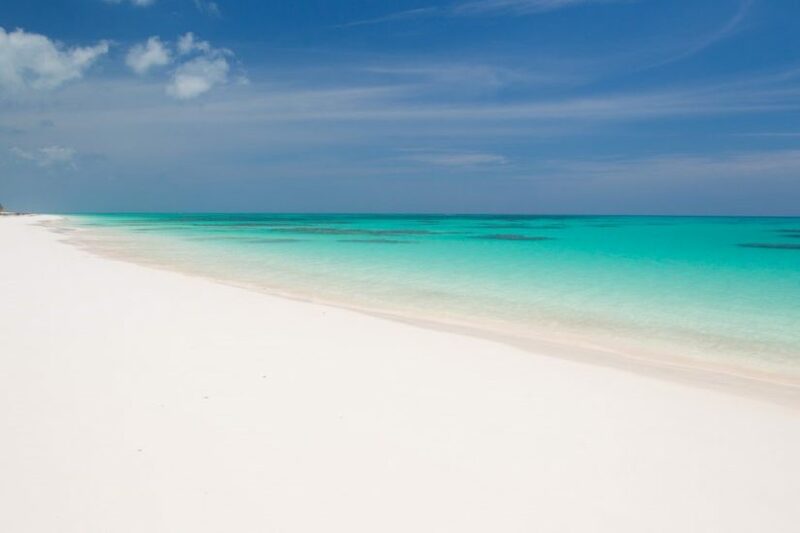 Once you’ve whiled away a lovely day on Pink Sand Beach, recognised as one of the very best beaches in Bahamas islands, you will be reluctant to tear yourself away! The question everyone asks is “Is it buried treasure or a sunken wreck”? There are lots of stories about this much-loved beach trying to explain the exciting title. My personal theory is that the reason this one of the best beaches in Bahamas got its name is more to do with the priceless beauty of the natural wonders that greet lucky visitors. Prepare to be wowed by the sheer scale and expanse of fine sand that stretches across a distance of three and a half miles towards the gentle and shallow shoreline of the sea. 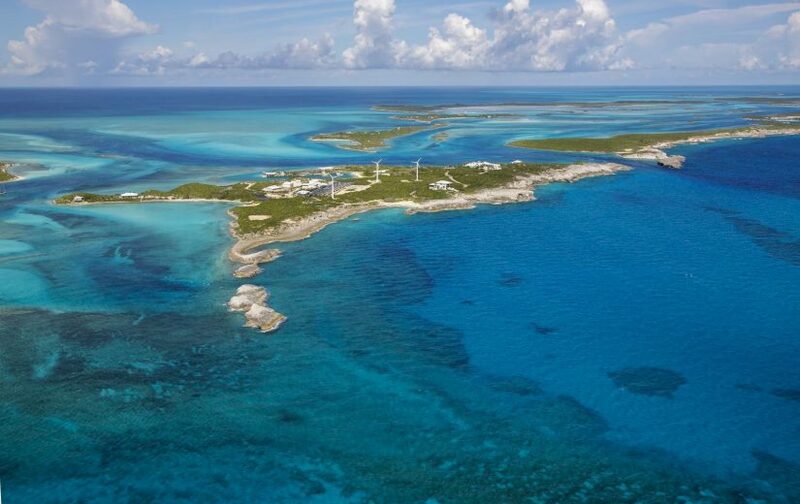 The Abacos are a group of islands within the northern region of The Bahamas. 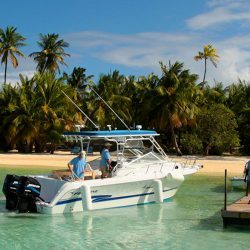 They offer lots of pretty coves and cays to be explored by boat but certainly my favourite beach is Treasure Cay as it has space to enjoy all of nature’s finest with the nearby wonderful Coco Beach Bar and Grill to keep you sustained with food and yummy cocktails as you luxuriate under a shaded umbrella. This beach has been named in the top 10 readers’ poll by Caribbean Travel and Life magazine. You will have to visit yourself to see why it is considered to be one of the best beaches, Bahamas. This time we’re calling in to Andros Island. Its most northern settlement is home to Morgan’s Bluff beach. Now there is truly a history of buried treasure accompanying this fabulous half-mile beach of natural splendour. Sir Henry Morgan, the 17th Century pirate of fame is said to have stashed some of his loot near this beach. Happy Hunting! This lovely beach hosts the Annual Regatta Festival in July where you can watch traditional wooden Bahamian sloops compete in races offshore. To truly embrace the Morgan Bluff experience, you can imbibe a shot or two of Captain Morgan Rum named after the rascal Henry Morgan himself! 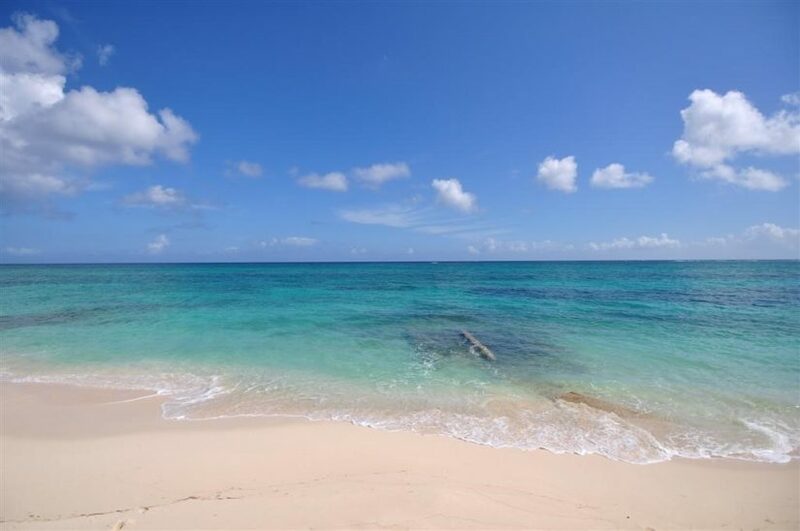 This beach located in Central Eleuthera is host to The Bahamas best beaches for surfers. Considered to be up there with the quality of surfing found in Hawaii, this island beach captures some great waves that come in off the Atlantic. The beach is pretty deserted, so you will need to bring your set-up for the day plus board. Try the nearby Gregory Town for surf gear and supplies. If you are an experienced surfer, you will be enjoying hanging out with the surfers on this beach. 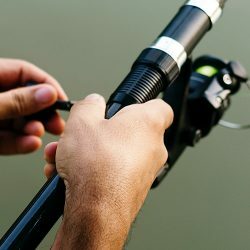 If you are a newbie to the sport, do your research before you travel and book some surf lessons through Bahamas Adventures who operate on this island. If you are someone who is utterly bored (board!) by your feeble attempts to get upright and ride the waves, don’t despair, a day sitting on Surfer’s Beach watching the talented surfer’s slice through the surf can be an exhilarating experience too. For the ultimate in paradise and privacy, you can rent the entire of Over Yonder Cay island and enjoy snorkelling, swimming, water skiing and picnicking around some of the prettiest and most natural of beaches that sit adjacent to four luxurious villas on this 72-acre Eden. Whale Bone Beach sits on the western side of this self-sustaining island and offers warm and sheltered waters for guests of all ages to enjoy. This is the ultimate in exclusive and luxurious vacationing. Bigger isn’t always better … this little beach is like a perfect jewel! Read about how to get to the Bahamas. If an amazing beach is the lure to get you on a plane, then The Bahamas is the ultimate destination for you. 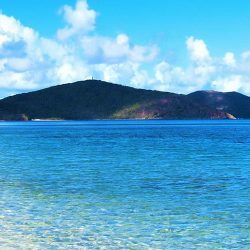 With over 700 islands deliciously spread over some of the loveliest waters of the Atlantic (yes, the Atlantic), you can be assured of a myriad of beaches, coves and cays to satisfy the most demanding of beach enthusiasts. Although technically The Bahamas is in the Atlantic Ocean, it captures the collective imagination of what the perfect Caribbean destination entails. It has swathes of white, powdery sand beaches, dotted here and there with the ubiquitous palm trees. There are abundant coral shelves and walls near-shore that cater to the under-water explorer and calm conditions on the surface to allow paddle boarding and kayaking in relative safely. The Bahamas has been welcoming visitors for centuries and understands that the cleanliness and unspoiled nature of the beaches is the continuing attraction for guests who return over and over again. With so many islands to explore and so many adventures to take, it can be your life’s work to figure out which exactly are the best beaches in the Bahamas. Enjoy the challenge! It’s one of those lifetime goals that will be a joy to accomplish!